Somehow out of the blue (really?) comes this young Slovenian pianist, immediately with a solo recording on the Clean Feed label. She has just obtained her degree in musicology with her master's thesis on "Cecil Taylor : Live As ... Structure within a Free Improvisation" at the Amsterdam Conservatory. Yet this is already her sixth album release, at the young age of 26, sorry 27 it is her birthday today. Her music isn't anything like Cecil Taylor's. Her music is an eclectic blend of classical, jazz, modernism, avant-garde, impressionism .... and Cecil Taylor. 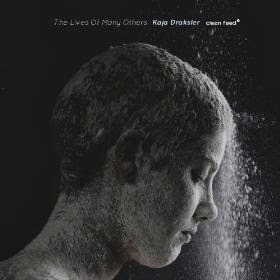 What is more, the music is Kaja Draksler's entirely. It is actually entirely modern, and that is possibly most audible in the constant change in her music, with ideas that never last much longer than a few moments, because other things need to happen, no need to keep expanding on what already is, new things need to happen, and do happen, with the restlesness and eagerness of a young adult discovering sound and telling us about it. No need to elaborate for her. Her messages are short, like on Facebook, or Twitter. But they touch life, they touch some essence of drama and storytelling. The title track starts with solid noise from inside the piano, rhythmic, scraping and pounding, as the intro to a beautiful, almost Jarret-like melody, with left hand and right hand dancing an odd-metered separate tune, just briefly, until the scraping takes over again. What has happened? "Vsi so venci vejli" (All the wreaths lay drying) is eery and quiet, fragile and sensitive, sad and beautiful, based on a traditional Slovenian poem. "Communicational Entropy/Andromeda" pulls us out of our reverie, with percussive playing, heavy chords and dramatic developments, but the story-teller that she is, Draksler then leaves space to silence, to emphasise the dying sounds, to slowly generate new light touches on just a few keys, well-paced, minimal, like new life emerging out of nothing. Then comes "Suite: Wronger/Eerier/Strong than (just a thought) I recall" and as its title suggests, thing move, things change the whole time, and sound eery, with phrases like ripples on the water, with both hands in colliding courses and in different phases, creating space, emphasis, single chords, silence, erupting rhythm by left hand stopped by the right one, yet gaining momentum, or not? She plays with patterns, and surprises the listener by shifting expectations, by going against the rhythm. "I Walked Into Yesterday" is also strange, with open structure and chords, almost hesitating, with an element of surprise. "Army of Drops" is more jazzy, faster, again in a well-paced and structured piece, with gradually increasing intensity over a single repetitive left hand, and light touches in the higher notes, contrasting darkness and light. The album ends with "Delicious Irony", a kind of deconstructed jazz piece, but one that again evolves into pattern and recognition, with a rhythm, a melody and chords that are pure jazz to finish, as if everything comes together at the end, and we come full circle, with a kind of wink to tradition, or to create a stark contrast with the avant-garde opening sounds of the album. In short, what you get here is fresh music, incredibly fresh, vibrant, clever and sensitive, beautiful and daring, coherent and creative, varied and strong. It is captivating too, because Draksler is a great story-teller, somebody who gets your attention and never lets it wander away, because new stuff comes up all the time, like twists in a plot and new characters entering. And it is so fresh, like morning dew, like a bowl of fresh salad, like cool water on a hot day.